Magnolia Pictures has shared the first trailer and movie poster for Steve Jobs: The Man in the Machine with Mashable, just over four months after the film premiered at SXSW 2015 in Austin, Texas. The upcoming documentary, directed by Oscar-winning filmmaker Alex Gibney, portrays Jobs as both a tech visionary and unapologetic leader throughout his career at Apple. Apple senior executive Eddy Cue expressed disappointment in the documentary following its debut, describing the film on Twitter as "an inaccurate and mean-spirited view of my friend" and "not a reflection of the Steve I knew." Cue added that the best portrayal of Jobs is in the book Becoming Steve Jobs by Brent Schlender and Rick Tetzeli, which he describes as "well done and first to get it right." Universal previously released the full-length trailer for its aptly named Steve Jobs movie, starring Michael Fassbender, Seth Rogen, Kate Winslet and Jeff Daniels, earlier this month. The trailer mainly consists of a single shot of Fassbender as Jobs, with cast voiceovers providing snippets and teases of conversations regarding Jobs' true legacy at Apple, which he co-founded with Steve Wozniak and Ronald Wayne in 1974. 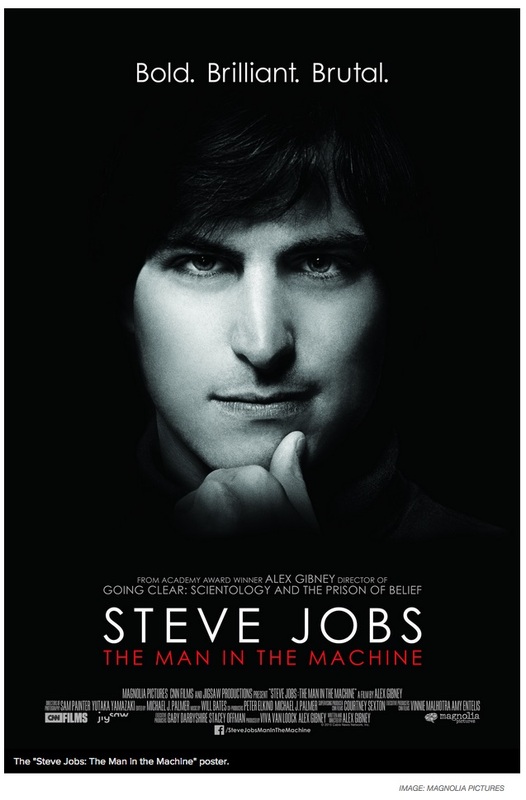 Steve Jobs: The Man in the Machine opens in select theaters on September 4. That trailer looks pretty accurate to me based on what I've read in the past. Let's face it, Cue and others on the Executive Team will likely always look at Steve through rose-colored glasses. That's only natural. To be in the position Jobs was in with the amount of influence he had, he was bound to have plenty of enemies and people he pissed off. And, like most people who have positions similar to the one he had, he didn't give a damn about those people. Anybody else want there to be a movie about Woz? I mean, yes Steve Jobs was very important to Apple, but so was Steve Wozniak. I don't think this looks mean-spirited at all. First I heard of Apple was those terrible PCs they made in the late 90s, they were a laughing stock and all us Windows users were disgusted by them. Wasn't until the iPod that Apple became a thing and Macs have only recently started to become popular thanx to the iPhone and iPad. That's funny because all I remember are us (mostly friends and family) Apple users laughing at Windows users because no one ever wanted to use PC (even PC owners) but they had to for work or because they only wanted to spend $1000 for a spreadsheet PC or $500 for an email PC. Sure the PC ran more software and costs a little less but between all the viruses, Windows launch failures and commoditizing of the PC market, we were happy to pay a little more for Macs and iPods, etc. I guess not much has changed from where I stand. I don't understand why him being an ******* sometimes is perceived to be a bad thing. Sometimes it takes a$$holes to get things done in this world. This man changed the world multiple times in his lifetime and he died early. After reading Isaacson's book, I became a bigger fan than I already was. Outside of screwing Kotke out of those shares, his day to day work ethic was got things done and every single person reading this article would have a different life if it wasn't for Steve's "bad attitude". What exactly does Eddy Cue know about working with the pre-96 Steve Jobs? There's plenty of other people who worked with him before that, and they deserve to have some input too, you know. And don't forget to share your opinion, thoughts and comments with respect.